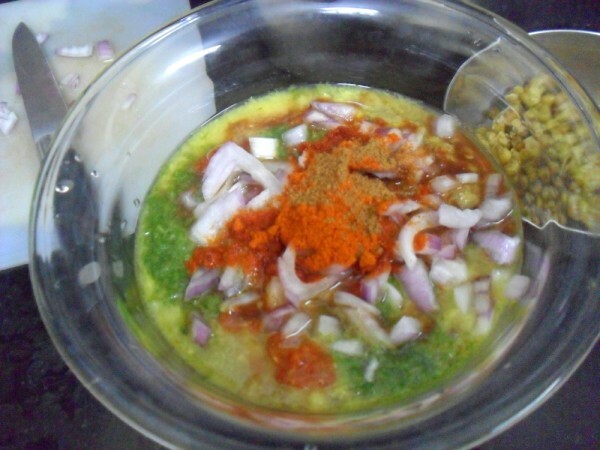 For the second day of Combo Dishes, I selected to make Daal Moong with Satpura, a typical combination from the Sindhi Cuisine. As expected this was suggested by Vaishali and I went on to search for the recipe. Somehow this didn’t turn out in the search and I had to ask her for the link. checking this, I was really intrigued as the dal is a sort of assembled dish. 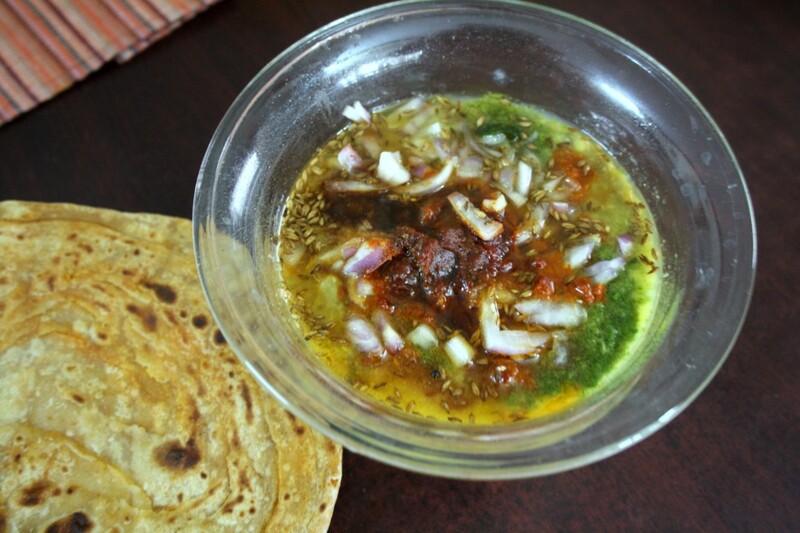 Vaishali says Daal moong is a typical Sindhi breakfast, however in recent times with many preferring lighter breakfast, this combination has shifted to lunch. I do agree on this, having made this for the lunch today. The dal was superb and the rotis were spicy and heavy . 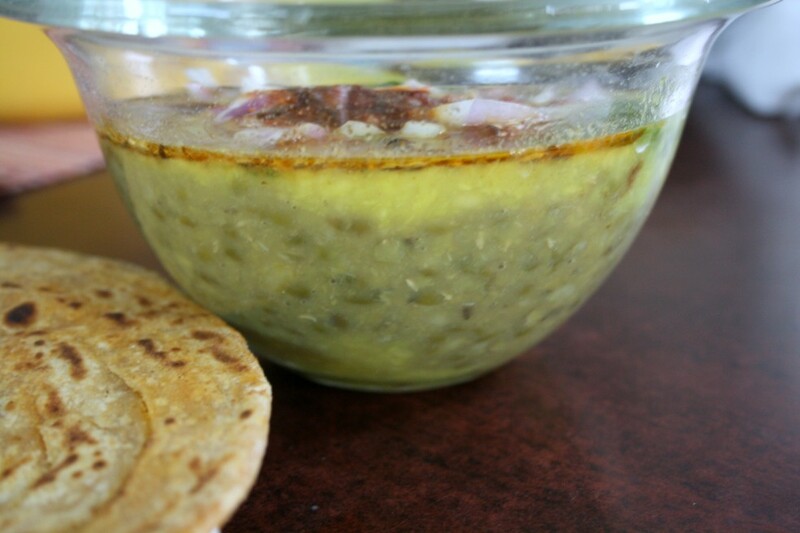 The dal is a combination of two dals cooked separately, garnished with spices, raw onions and chutneys. The final mix of all the assembled ingredients makes a it a feast! I was supposed to make it for dinner yesterday, however with a party I couldn’t manage. So I was all geared up to make this for my lunch. When kids left for school, I started making this. Though the process sounds lengthy, you can make the dal quite quickly. I always feel that a dish takes forever as I end up clicking each step. And feel the actual dish is very simple and would think I would actually know how simple when I make it again. As always there are so many new dishes to make that I wonder if I get back to the same one, that captured your fancy. This dal becomes very easy if you have the chutneys handy. So do try this out and enjoy. I surely enjoyed it. Wash the dal, add turmeric powder and pressure cook till the dal is soft. Once the pressure is off, add salt and mash well with a churner. 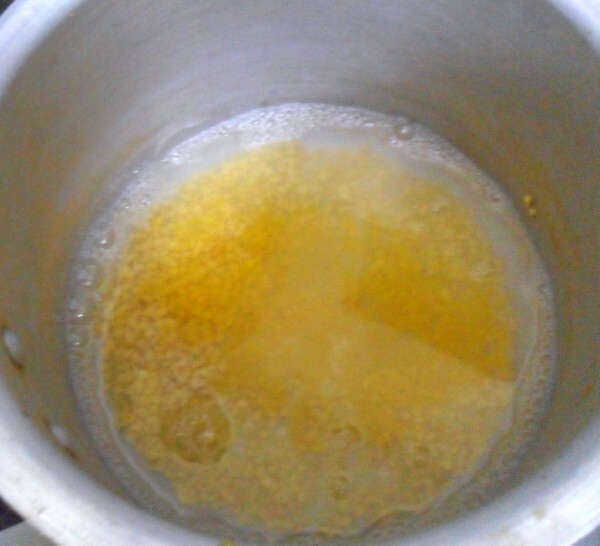 Wash and pressure cook with turmeric. Once the pressure falls, remove add salt and churn well to get a soft and well cooked dal. 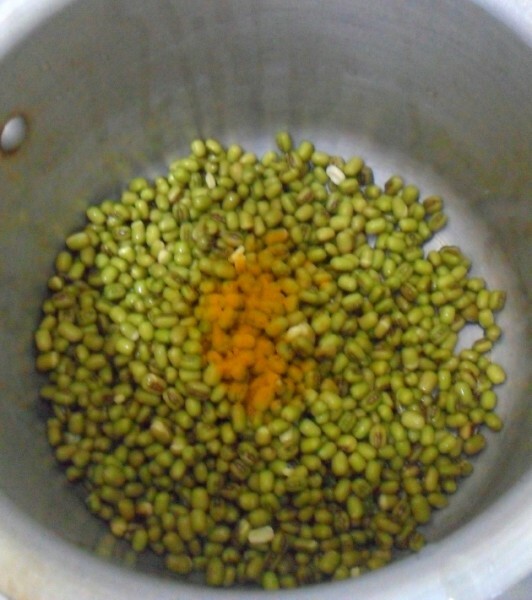 In a serving bowl put a layer of moong. 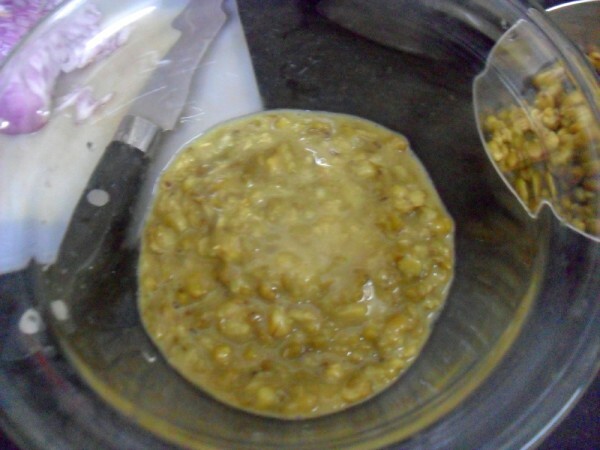 Another layer of cooked yellow daal. 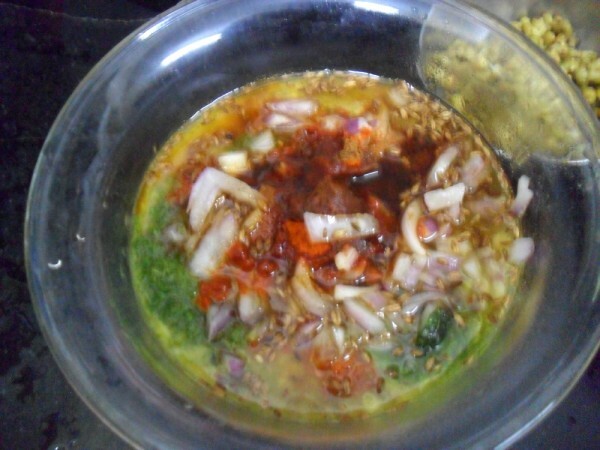 Add one spoonful of green chutney, Sweet Imli Chutney over the dals, add the finely chopped onions. Over this, sprinkle spices generously since the dal doesn’t have any spice at all. Heat ghee add shahi jeera/ jeera. Once they crackle, pour on spices. 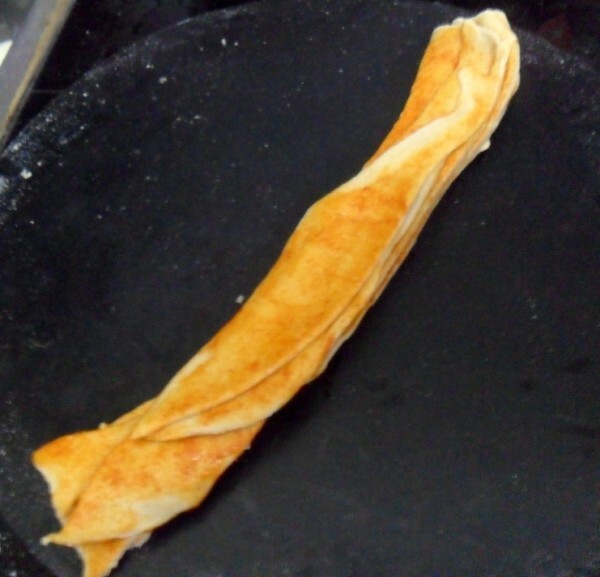 The satpura is a layered paratha. Sat means ‘seven’ and pur means ‘layers’. 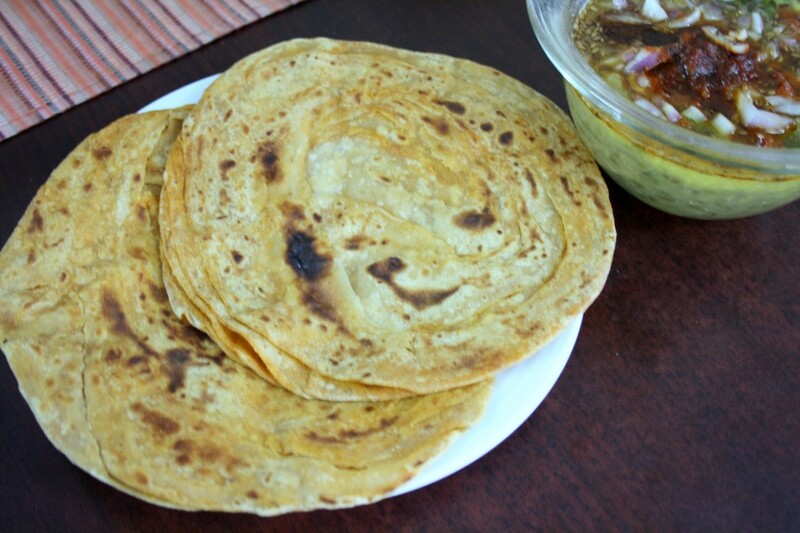 It is made from regular chapatti dough. Knead a soft dough with just enough water. Make a big ball and roll it out to a thick disc. 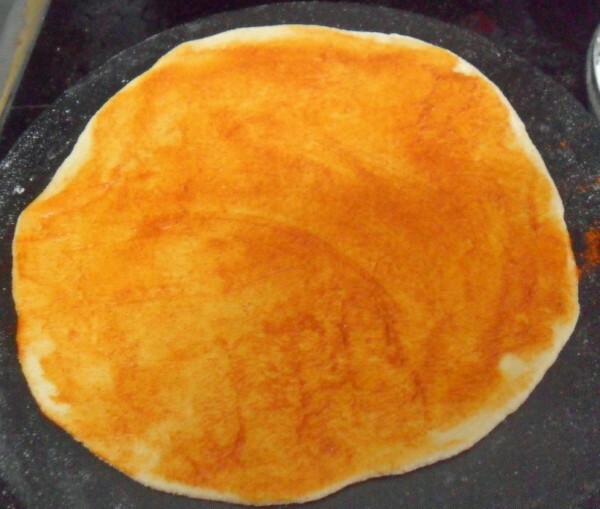 Smear with ghee, sprinkle salt, red chili powder and flour. Spread it ont he disc. Cut strips. 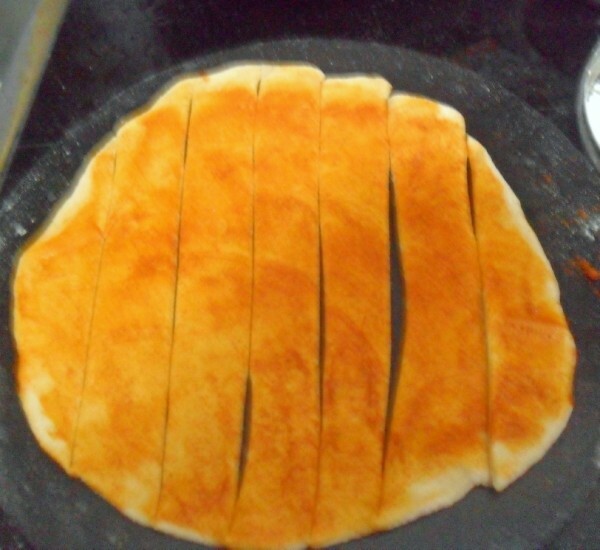 Heat a tawa and cook the roti on both sides with oil. 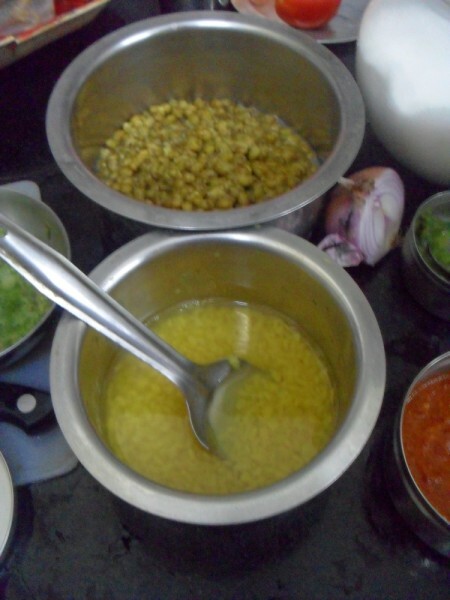 The original recipe calls for Cardamon powder to be added to the yellow dal, I skipped. 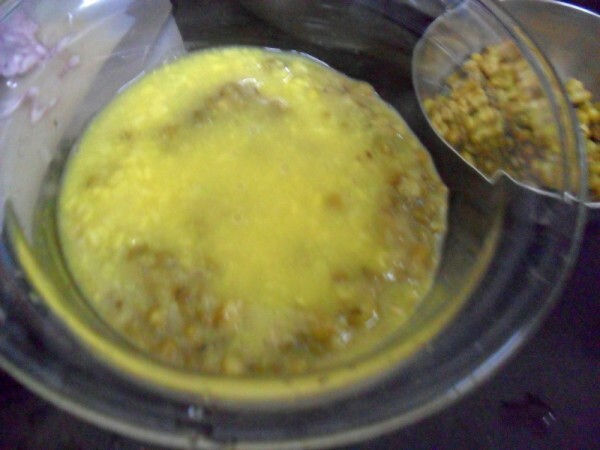 Also Vaishali asks for the yellow dal to be soaked, I normally never soak as pressure cooking does the job. Though you end up mixing the entire setup in the dal, I wished it stayed the different layers before clicking. so maybe I should have a thicker dal. It again depends how thick you want your dal to be. For the dal, I forgot to add Coriander powder and Amchoor. Next time I will surely add them. This combination turned out to be deadly! 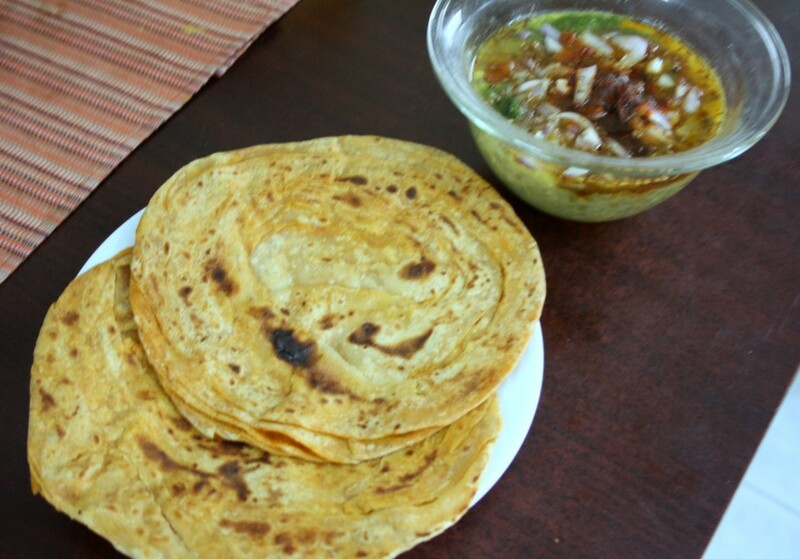 The rotis were spicy and the mild dal was a perfect combination. I was really so happy I tried this. as you have said – the combination is looking deadly.. awesome is the word!! I have already tried satpura from Sindhi Rasoi, but daal moong havent tried with satpura, now u r pulling me to make this combo. Lovely combo! I had initially planned to make this as well , but in the last minute due to some plans at home, couldn't go thru. I hope I can make these in the future! That is such a yummy combo. 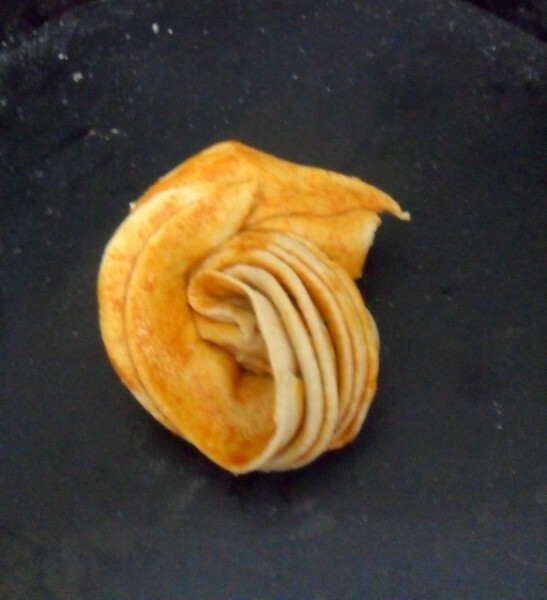 Satpuras look flaky and delicious. Will try soon. Mouthwatering cobo this is in my list too. you made the satpuro so perfectly Valli. now it's my turn let'see how Iam going to make them. Perfectly made:)) yes the Dalal's havetobeslightly thicker, and I soak the Dalal's because even after washing they lend a peculiar smell..but if soaked thesmellis not there.It is all about your style.do try with aamchoor pwd..which gives a super taste. I missed making this combo for the event. I also wanted to try out Vaishali's recipe. in fact that is the only recipe that pops out when you search for this combo. Now there will be yours coming up as well. I will definitely make this combo soon! 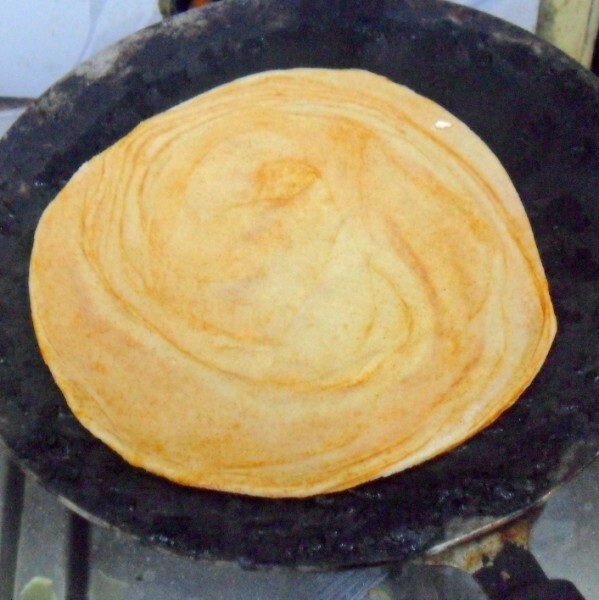 Looks delicious…..never tasted satpura pulka. Will do it soon.